This is a one of those really cool magic tricks for kids. 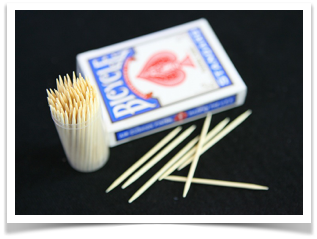 It is very easy to do and all you need are a couple of toothpicks and a somewhere the toothpick can ‘hang over’, like a pack of cards, a table top or ledge. This trick can be performed anywhere. The electric toothpick trick creates an amazing effect where the resting toothpick ‘jumps’ when it touches the toothpick in your hand, almost as though the toothpick in your hand is charged with electricity. This is done by ‘picking’ the end of the toothpick in your hand with your fingernail on the middle finger. It is all about the timing. Picking the toothpick in your hand as you touch the tip of the other toothpick will make it do a massive jump. This picking is done under the cover of your hand. You now know how to do the Electric Toothpick Trick.